I grew up on apple pie. It is a family tradition in our family. It was the one dessert that all seven of us in the family liked, so Mom made it often. She took my Gramma John’s pie crust recipe and her basic techniques and tweaked them a little. 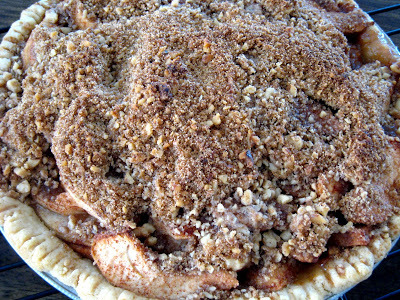 If it’s loaded with cinnamon and nuts, my mom must have had something to do with it. Here’s a pictorial montage (is that a good word?) for how we make apple pie in our family. 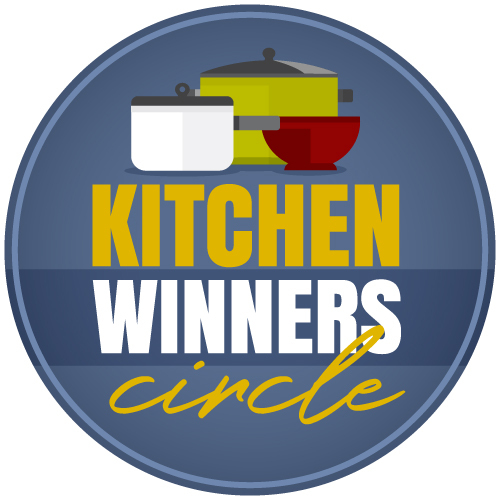 Make the pie crust. You might like Gramma John’s. 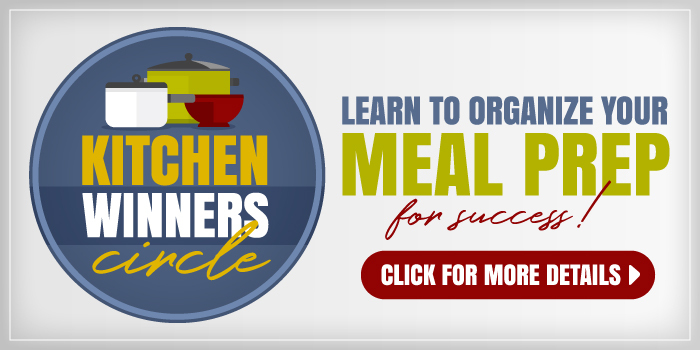 It’s super easy to make in the food processor and involves no complicated devices like rolling pins. Just pat it in the pan! Stow it in the fridge while you make the filling and topping. Make sure that it is sitting precariously atop some unstable containers. That keeps things exciting. Peel, core, and slice six apples. Prepare the crumb topping. 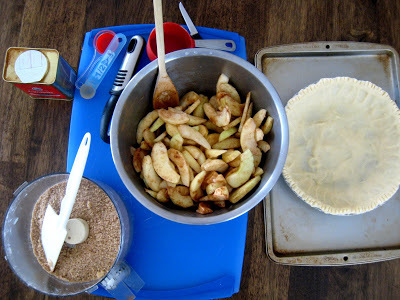 Lay out all your ingredients: pie crust, apple filling, crumb topping. Make sure you have an adorable assistant standing by to help youPlace the pie shell on a rimmed baking sheet to catch any drips that may happen in the oven. Pour the apples into the shell. 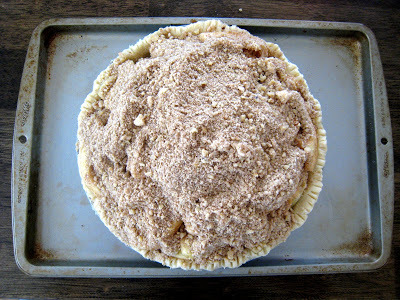 Sprinkle the crumb topping over the apples. Bake. Cool on a rack. Enjoy! Preheat oven to 375 &deg. 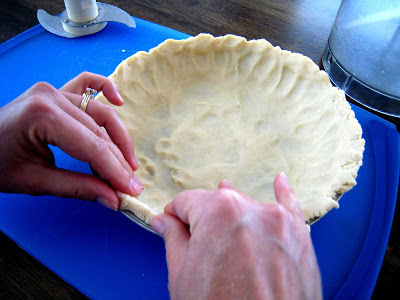 Place unbaked pie shell on a rimmed baking sheet. 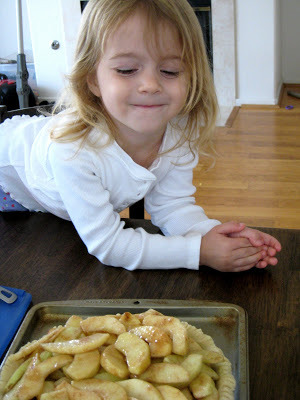 In a large mixing bowl, combine apples, sugar, cinnamon, and lemon juice. Pour into pie shell. 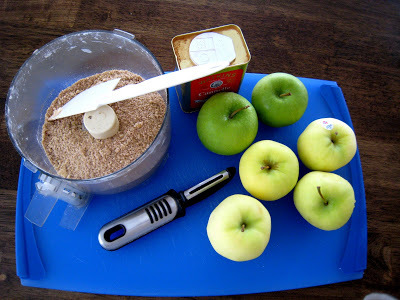 In food processor combine flour, butter, brown sugar, walnuts, cinnamon, and almond extract. Pulse until coarse crumbs are formed. Sprinkle evenly over surface of apples. 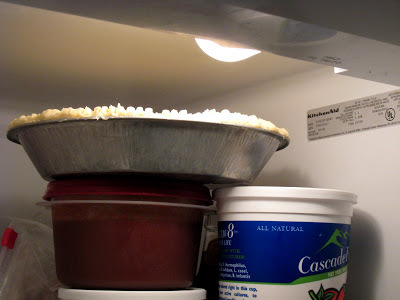 At this point, the pie can be wrapped in double layers of foil and stored in the freezer, for up to 2 months. Do not thaw before baking. Bake for about 1 hour or until filling bubbles. If needed, cover with a sheet of aluminum foil to prevent burning. If baking from frozen, bake for 15 minutes at 400, and then continue with the regular directions. — For more fall traditions, visit Simply Sugar and Gluten Free. — For more things that will work for you, check out We are That Family. 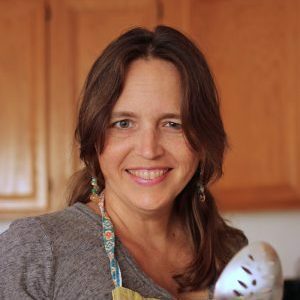 — Tammy’s Recipes has all sorts of apple recipes today! I love seeing the Watkins Cinnamon in the pics!! it’s the only kind out there!! Is this a freezer-friendly pie? At what point in recipe do you freeze? Is there a special way to pack it? thank you! Yes, prior to baking, wrap it tightly in aluminum foil and freeze it. If the pan fits in a large ziptop bag, so much the better. When baking, don’t thaw. Just preheat the oven to 425 &deg. Bake for 15 minutes. Then reduce the heat to 375 and bake until it’s done, about another 45 minutes or until the filling bubbles. I’m ready for apple season! Possibly a dumb question-but are you supposed to cook the apples first in a pot? Or just cut them up, mix them with the other stuff and bake it all? I have never made a pie in my life but after seeing this, im trying it this weekend. Looks good!